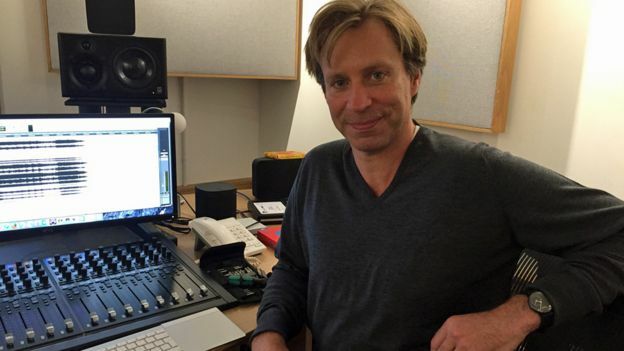 Giles Martin reveals how he took The Beatles master tapes and remixed them in surround sound for the Fab Four’s new video collection. Abbey Road is full of gremlins. 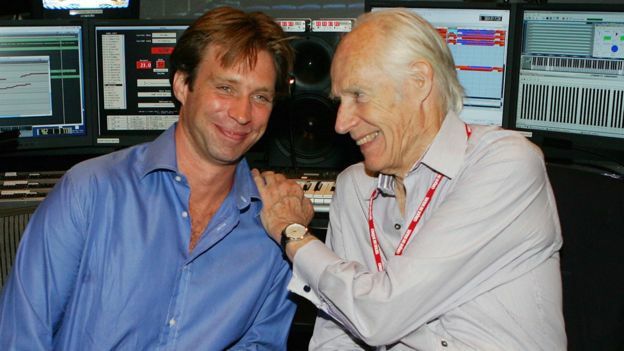 Giles Martin – son of record producer George Martin – can’t play any music through his mixing desk at the iconic North London studios. He re-boots his computer while two engineers crawl on the floor, plugging in cables and fiddling with various switches. At one point, someone unplugs a hard drive. “Oh God, you’ve just deleted the Beatles,” Martin deadpans. Eventually, the equipment springs to life. The producer dismisses a workman, who has appeared to drill locks into the door, and apologises for the delay. “I just moved into this studio yesterday,” he explains. With that, Martin loads up a file that contains dozens of versions of the Beatles’ back catalogue. There are the original recordings, mono mixes, stereo remasters and various other snippets – all of which Martin can flick between at will. He used these tracks as a reference while producing a new DVD compilation, Beatles 1+, which sees the Fab Four’s biggest hits re-imagined in stereo and 5.1 surround sound, accompanied by restored promotional videos and films. Rather than viewing the originals as sacred, the band appreciate their music being tweaked this way, he says. Counter-intuitively, Martin’s new mixes are often simpler than the existing stereo versions – but he has a solid explanation. Up to Yellow Submarine, the Beatles treated the mono mixes of their albums as the definitive documents. The stereo versions were created as an afterthought, often without the band’s involvement. “My dad was never happy with the extreme panning that went on,” explains the producer. “You’d have the band on one side and all the vocals on the other. So he set about recapturing the power of those mono recordings. “In Beatles world, if you can make something more aggressive, they want it more aggressive,” Martin says, cueing up Paperback Writer to prove his point. “If you listen, this mono mix is very crunchy, very in your face,” he says, as the textured harmonies give way to Paul McCartney’s guitar riff. “The guitar riff is what you remember about that song,” he says, but it loses its oomph by being shifted to one side. Accordingly, the new mix puts the instruments into a focussed central point, while spreading the vocals across the front speakers. The rear speakers present a separate challenge. Rather than placing Ringo’s drums behind the listener, or making vocals circle the room, Martin opts for restraint. “Dolby came to see me with 5.1 when it was new,” he explains, “and they’d mixed What’s Going On by Marvin Gaye in surround sound, with the guitar coming out of the right rear speaker. Over-using those rear channels is “really distracting,” Martin argues, so he came up with an ingenious solution. He went into Abbey Road’s Studio 2, wired up a “really big” loudspeaker and played the original Beatles recordings at full volume. “We acted like the band were playing in there again, and recorded the walls using the original Beatles microphones,” he says. Those reverberations and echoes were then placed into the rear speakers to give “the illusion of being in the room with the band”. 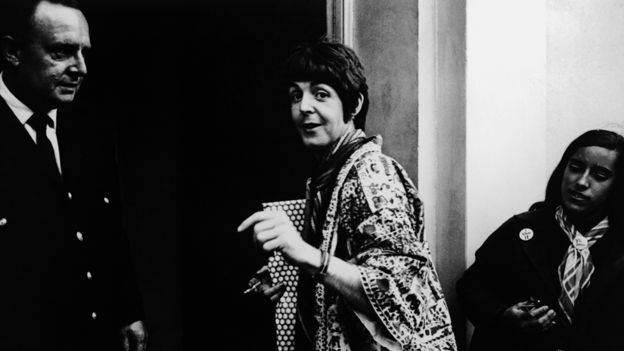 With the later Beatles recordings, however, he had more opportunity to be playful. 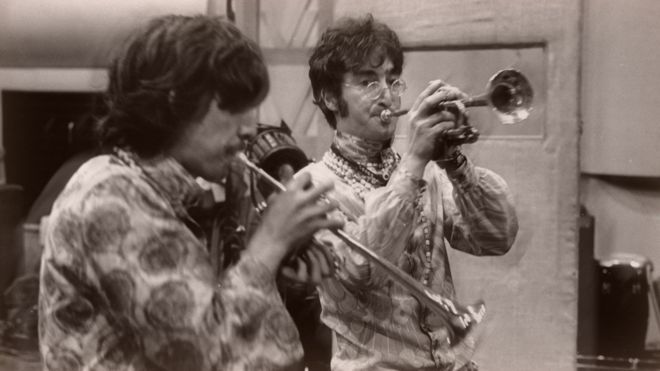 “Strawberry Fields is more of a sound picture than a song,” Martin says, scrolling over to John Lennon’s masterpiece, and locating the descending svarmandal figure (the one that sounds like a sitar) between the first chorus and second verse. But Martin also made a more elemental tweak. “The mono Strawberry Fields – the one the Beatles mixed – is slightly more intense and more condensed. There’s a mellotron pulse under John’s voice which forms a sort of harmonic for his vocal. In the stereo it’s off to one side and, as a result, John’s voice sounds thinner. “I said: ‘OK, if we’re doing a new mix of this, we should do one that sounds like the mono. So we came up with this,” he says, pressing play on the updated version which, it has to be said, sounds much more fulsome. 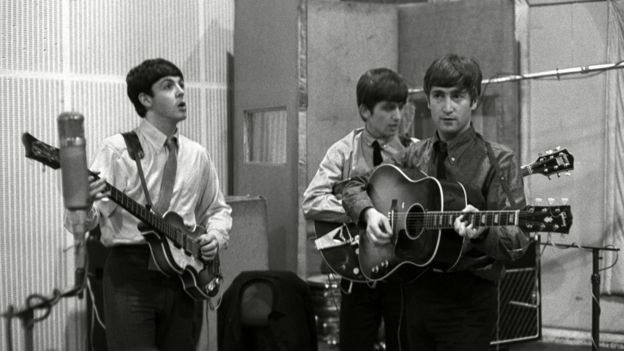 In making such decisions, Martin tried to put himself into the mindset of John, Paul, Ringo and the two Georges as they worked – just metres away from where he’s sitting – in the 1960s. Martin confesses to one glaring mistake: The stereo mix of Lennon and McCartney’s kitchen sink symphony A Day In The Life is missing a piano, because he opted to use the version created for the Cirque Du Soleil show, Love. “All of these fans will be going: ‘Why did you take this piano off?’ And the answer is I didn’t – I just used the Love version,” he cringes. Martin is modest about his achievements, saying more than once that “there’s no talent in what I do”. And he admits his every decision will be pored over by Beatles obsessives. Ultimately, he would have liked to be more inventive with the surround mixes but had to “rein myself in, because these are the Beatles number one hits”. The Beatles 1+ is out now.